Review: Life is nearly normal for nineteen-year-old Ry and his mother and sister. After his abusive father, Marvin Burke, destroyed their lives, Ry has worked to shed his life of the terrifying memories. In a horrific look at mental illness, Daniel Kraus takes readers into the minds of Ry and Marvin in Scowler. On their dilapidated farm, Ry, his mother, and sister try to eek out a life that brings some normalcy to their damaged lives. They think they've succeeded until an escaped convict shows up on their property. 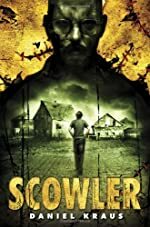 After learning of the catastrophe at the prison and finding out that Marvin had been transferred to that prison, Ry and his mother know it's time to leave their farm behind and run away to a new life. But, when Marvin surprises them as they are packing, they know their hopes of escape are shattered. Fourteen minutes later, a meteor crashing onto their land offers a distraction and hope, but the fervor of Marvin's find sends their lives into an even more disturbing tailspin. As imaginary friends of Ry's past come once again to life, he finds that maybe there is a monster lying in wait inside him too. Scowler is an unnerving look into the world of the mentally disturbed. It is filled with symbolism and depth that is often not present in young adult books of this genre. However, Scowler could just as easily been a novella. In fact, it might have been more effective. At times it seems as if Kraus is trying to fill pages by adding unnecessary details. Readers might find themselves saying, "Get on with it . . ." The overall storyline has the potential to be truly terrifying, but the over-development of inconsequential details takes the reader away from the actually in-depth plotline. Nonetheless the fear, blood and gore, and disturbing characters will definitely appeal to young adult readers. We would like to thank Random House for providing a copy of Scowler for this review. Have you read Scowler? How would you rate it?